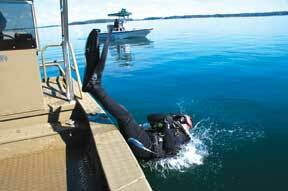 Being a conservation officer for the S.C. Department of Natural Resources requires dedication, courage and integrity. Meet the men and women who answer the call to take on this toughest of law enforcement challenges. From his vantage point - tucked back into the woods about seventy-five yards off a winding Williamsburg County secondary road lined with cotton fields - S.C. Department of Natural Resources Conservation Officer Benjy Byers, a veteran officer with fourteen years on the job, could easily see the bright beam from a spotlight playing across rows of cotton stubble and the pickup truck, lit up in shades of green, through the lenses of his night vision goggles; or as he and his fellow conservation officers call them, "NVGs." Byers radioed his partner, twelve-year DNR veteran Thomas Kelly. "That's it, they're working it right now, see the light?" Kelly rubbed his eyes in disbelief and looked again. "I don't see what you're talking about," he radioed back. Operation Game Thief, how may I help you?" Like many of the thousands of criminal investigations undertaken by the DNR's Law Enforcement Division each year, this one started with a phone call from a concerned citizen. The operators in the DNR's central dispatch center monitor telephones and radios twenty-four hours a day, seven days a week, providing a vital link between citizens and officers in the field and directing officers to cases involving everything from illegal dumping of trash and nuisance alligators to night hunting for deer and fatal boating accidents. The case that Kelly and Byers were working that night began with a telephone call from a Williamsburg County farmer who'd run across several deer carcasses - heads and antlers removed and edible meat left to rot - while harvesting his cotton. Upon investigating, Kelly immediately suspected night hunters, individuals who, lacking the necessary outdoor skills to harvest a trophy deer within the guidelines of the law, resort to "spotlighting" them at night. "It's just stealing, is what it is," said Kelly. Working with the command leadership in DNR's Law Enforcement Region II, he organized a seven-night stakeout of the surrounding cotton fields with the help of officers from adjacent counties. Everyone was eager to lend a hand, but seven nights of watching and waiting in shifts throughout the wee hours hadn't yielded anything . . . until that mysterious pickup passed slowly by Kelly and Byers' position just before midnight on Sunday. Things moved quickly after Byers flicked on the blue light, and, for just an instant, the truck looked like it might take off - "They thought about running, but it was too late," recalled Kelly with a chuckle. Realizing their license tag had probably already been recorded (it had), the truck's occupants gave up without a chase. After securing the two men in handcuffs - a father and son, one dressed all in camo, the other dressed "like he was going to church," said Kelly - the two officers began examining the contents of the truck. They soon figured out the mystery of why Kelly had been unable to see the spotlight with his naked eyes. The two outlaws were also using some high-tech equipment: a heavy-barreled, sniper-type rifle equipped with a night vision scope and a class-III silencer. Between the seats, they discovered a high-powered spotlight that had been outfitted with an infrared lens. The resulting beam could only be seen by someone looking through a night vision scope or glasses. The two lawbreakers thought their technology made them invisible, but on this night, the good guys were one step ahead. Further search of the vehicle also revealed a digital camera, with picture after picture detailing numerous violations of the state's game and fish laws - not very smart. Without the availability of the NVGs Byers was using on patrol that night, "they could've been looking right at one [a deer] and we wouldn't have known it," said Kelly. Now the high-tech equipment forfeited by the poachers in court is in the hands of DNR officers. This story is just one example of the patience, persistence and exhaustive in-the-field police work that goes on around the state on a daily (and nightly) basis, as the men and women in the DNR's four law enforcement regions go about the business of enforcing the state's game and fish laws. It's a tough job; maybe the toughest there is. The job of "game warden" in South Carolina has evolved considerably since Chief A.A. Richardson was named the state's top warden in 1913 and took on the task of building a modern fish and wildlife agency pretty much from scratch. In those days, wardens had little in the way of formal training or support, instead relying on grit and common sense to get the job done. Back then, wardens like Augustus M. "Mac" Flood in Berkeley County patrolled on horseback, with little more than a badge, a ticket book and their own guns, but a lot has changed over the past century. Like the DNR itself, the role of conservation officer has evolved to meet the challenges of a new century and an increasingly complex mission. Basic enforcement of game and fish regulations is still a primary responsibility, but on any given day (or night), the officers of our modern-day DNR might also be called upon to assist another law enforcement agency with a manhunt or missing persons case; investigate a hunting or boating accident or a case of illegal dumping; provide security at a state port or nuclear facility; keep order during an extreme weather event or evacuation; speak to a community group; or help out at a fishing rodeo or youth hunt. It's a highly challenging environment. Many people like the outdoors and dream of "wearing the green," but only the very best make the final cut for this intensely demanding job. "The qualities I look for in a young officer are self discipline, a strong work ethic and the ability to work without supervision, think on your feet and make good decisions," said Captain Harvin Brock, a veteran officer who leads the DNR's Law Enforcement Region III - qualities he definitely sees in the new generation of officers that have entered the DNR's ranks in the last few years. "These young men and women have college degrees and are the best trained, best equipped conservation officers in the Southeast," added Brock. Although many aspects of the job of DNR conservation officer are common across the state, differences in geography, population and other factors mean each of South Carolina's four law enforcement regions also has its own unique challenges. 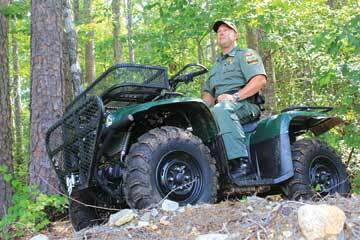 For officers in the Upstate, that may include negotiating rugged mountain terrain by foot or ATV. 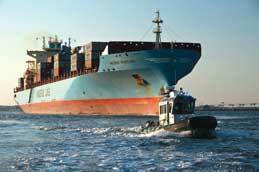 On the coast, officers may split their time between inland patrols and offshore work in salt water. DNR officers in all four regions can expect a generous mix of patrolling on land and water and a mix of rural, suburban and even urban environments. 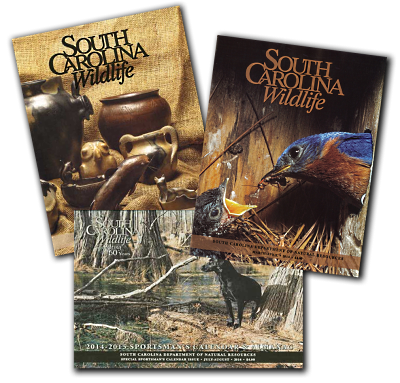 A growing population with a strong desire to have fun in the great South Carolina outdoors means violations of game and fish and littering laws, public safety issues and human-wildlife interactions are all on the rise. Stretching from the Blue Ridge Mountains, down the upper half of the state's "freshwater coast" border with Georgia and east to Laurens and Union counties, the DNR's Law Enforcement Region I, with 6,889 square miles of land and another 180 square miles of water, encompasses some of the most rugged and remote terrain in the Palmetto State. A monument overlooking the vast Jocassee Gorges area honors the late Franklin W. Gravely, whose legendary skills in the backcountry, firm but fair demeanor and unparalleled work ethic many believe set the standard for what it means to wear the green uniform. "Above all, I look for officers who have integrity and who are highly motivated, honest and loyal," said Region I Captain Jamie Landrum, a fifteen-year veteran who joined the DNR in 1997 after working five-and-a-half years for another law enforcement agency. "After seeing how professional the DNR officers always looked and presented themselves, I knew I wanted to be a part of this agency." 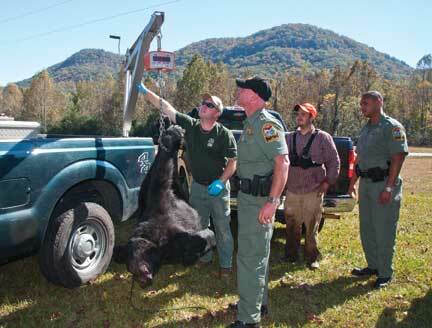 According to Landrum, one unique challenge for the officers in Region I involves managing the two-week-long black bear season. While a limited bear hunt was approved for three of South Carolina's coastal counties in 2011, the vast majority of the bear hunting activity in the state still takes place in the mountains of northern Greenville, Pickens and Oconee counties, where approximately a thousand black bears roam. "Last year  the bear season ended with eighty bears being harvested," said Landrum. "Seventy-four hunt parties registered for the one week running season." Region I officers also responded to more than 350 bear complaint calls in 2011, many of which necessitated trapping and relocation efforts. But the work doesn't end with bear season in Region I, not by a long shot. "DNR officers also patrol 161,216 acres of Wildlife Management Area (WMA) land in the Enoree Ranger District, 120,000 acres of WMA land in the Long Cane Ranger District, 84,000 acres of WMA land in the Andrew Pickens Ranger District, 33,000 acres of WMA land in the Jocassee Gorges, 4,664 acres of WMA land on Belfast WMA and 12,640 acres on the Keowee WMA," said Landrum. 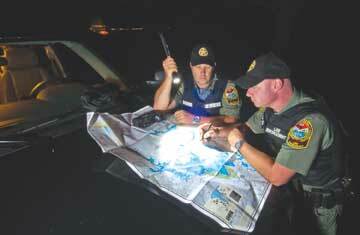 In 2011, DNR Officers in Region I issued 2,664 tickets and 6,162 written warnings. On top of that, as part of their homeland security duties, Region I officers are tasked with helping Duke Energy security forces protect Oconee Nuclear Station on Lake Keowee. Region I is also home to hydroelectric dams and facilities located on lakes Jocassee, Hartwell, Russell, Thurmond and the Bad Creek Reservoir. These facilities require homeland security assistance from DNR officers as well. The officers who patrol the woods and waters of Region II are responsible for enforcing the state's game and fish laws across 8,193 square miles of land, 37,583 acres of lakes and 1,695 miles of lake and river shoreline spread across thirteen counties. In fact, it's the largest of the four regions, in terms of land mass. "We have an extremely wide range of terrain to cover - from the swamps of Williamsburg County to the upper piedmont of York County," said Region II Captain Sandy Young. "This wide range of area also comes with a wide range of rules and regulations that vary greatly, depending on which part of the region you are patrolling." The upper part of Region II includes fast-growing urban areas south of Charlotte in York and Lancaster counties, where new neighborhoods in formerly wooded areas seem to crop up almost overnight. The urbanization of former rural areas is reflected in the 733 nuisance animal calls officers in the region responded to between July 2011 and June 2012. Adjacent to the burgeoning population center of Charlotte, the region sees a high percentage of out-of-state hunters. Region II also includes three nuclear facilities, and officers there logged more than 500 Homeland Security-related patrol hours last year. In the western section of Region II, officers patrol the rolling terrain and extensive watersheds of the Great Pee Dee and Little Pee Dee rivers, including hundreds of miles of tributary streams popular with anglers and paddlers. Overall in fiscal year 2012, Region II officers issued 2,168 summonses and 5,430 warning tickets. Young looks for officers with a strong commitment to protecting the state's natural resources who are independent-minded and self-motivated. "We do not have 'roll' call at start of shift," he said. In addition, he added, you've got to be able to remain calm in stressful, high-tension situations such as drownings, shootings or boating incidents. As far as his own motivation for taking on the challenge of wearing the green, Young said he never considered any other career. "This wasn't a career that I just happened to stumble upon in the job postings," said Young. "This was something that I wholeheartedly sought out and pursued. This isn't like any other regular day job and to be successful it's something you have to dedicate your life to, but where else can you go to work and hold an eagle in your hands or teach a child how to cast a fishing reel." Geographically speaking, lakes Murray and Marion are probably the most recognizable features of the 7,719 square miles that make up DNR Law Enforcement Region III. Spread across twelve counties in the Midlands region of the state, Region III is also home to eleven rivers, including the popular lower Saluda tailrace, beloved by anglers for its put-grow-and-take trout fishery and spring striper runs, and by paddlers for its class III and IV rapids. 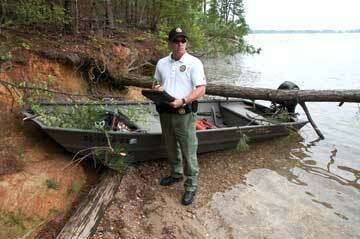 Region III officers spend a considerable amount of their time and effort on boating safety and enforcement. When summer hits, dealing with accidents, injuries and even fatalities on the water is, unfortunately, a regular part of the job. "The '100 Deadly Days of Summer' is not just a buzz word or phrase for us, but a constant reminder of the importance of the mission that our officers face each and every day in the summer," said Captain Harvin Brock. In 2011, Region III's forty-three full-time officers spent 4,929 hours patrolling in boats and another 189 hours investigating boating accidents. On the lower Saluda, a rapidly growing number of river users unfamiliar with the area's fast-changing currents can make for some very dangerous situations. Rescue and response techniques have changed to meet this growing need. "Our recovery and enforcement efforts on the lower Saluda have been kept up to speed with the use of zodiac boats or jet drive river boats," said Brock, a thirty-three-year department veteran. "Those have taken the place of line guns and john boats, and intense river rescue training for our officers is now standard." 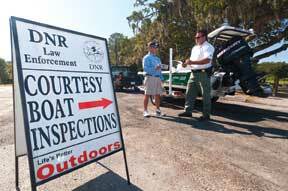 In Region III, as in other regions, courtesy boating inspections are a major tool for promoting boating safety. Between Memorial Day and Labor Day 2011, Region III officers conducted 71 courtesy boat inspections at marinas and boat landings, inspecting 472 different vessels and preventing 179 safety violations before those boats were ever put on the water. Despite having one of the state's largest metropolitan centers, the rural parts of Region III are heavily hunted in the fall, and like their counterparts in other areas of the state, Region III officers spend a great deal of time and effort enforcing game laws for deer, turkey, migratory birds and other small game species. 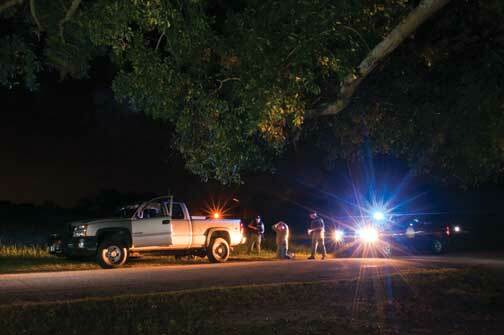 During 2011, Region III officers issued 1,891 summonses and 5,260 warning tickets. Six of the nine counties that make up DNR Law Enforcement Region IV border the Atlantic Ocean, and while the officers who work there have plenty of duties that mirror those of their inland counterparts, with 2,876 miles of tidal shoreline, 165 miles of beaches, more than forty barrier islands, state and federal enforcement responsibilities out to two-hundred miles offshore, and one of the nation's busiest commercial shipping ports, patrolling "in the salt" adds a whole other aspect to the job for many of the officers in this region. Region IV has the largest concentration of registered boats in the state. More than 4,200 commercial fishing licenses are sold annually in Region IV, and an estimated 2.6 million recreational fishing trips are made to the coast each year. 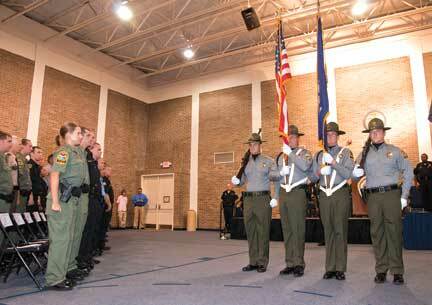 Region IV officers are also federally commissioned as U.S. Fish and Wildlife agents and as National Marine Fisheries agents in order to assist in the enforcement of federal game and fisheries regulations, whether on land or miles offshore. But Region IV officers must also keep up-to-date on inland game and fish regulations. The region is home to approximately 424,000 acres of Wildlife Management Area land and numerous large private tracts. "This job is not your typical nine-to-five, and we don't work specific schedules," said Region IV Captain Gentry Thames. "Officers must be able to determine when they need to be out in the field looking for activity and not rely on always being told when and where to go. An officer needs to be motivated to make himself get out of bed two to three hours before the duck hunters arrive in their blinds, or get out in the cold, blowing rain to catch that shrimp trawler dragging in closed waters." Among the qualities that Captain Thames lists as essential for being a successful conservation officer are, perhaps unsurprisingly, some of the exact same ones noted by his fellow captains in other districts - namely, self-motivation and commitment. Thames also includes patience and curiosity as traits he looks for in a young officer. "Once an officer learns to be patient, he or she will often uncover other violations by watching and listening before rushing in. Doing what I call sneakin' and peekin' has been extremely successful for me throughout my career," he said. "I've often sat and watched violators for extended periods of time without them ever having known I was there. 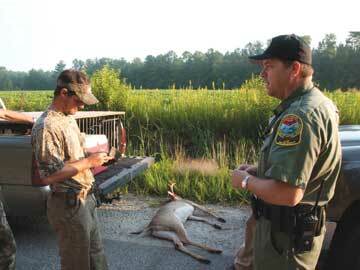 It's also true that a successful game warden is a curious game warden - What's down that road? Why are there foot tracks going that way? Where did that shot come from? When an officer is naturally curious, he or she gets off the main road, finds the out-of-the-way places that the bad guys frequent, and hones the skills needed to apprehend serious violators." However much it's changed in the decades since Chief Richardson, Mac Flood and Franklin Gravely hung up their badges, in some very fundamental ways, the job hasn't changed at all. First and foremost, it's still a very tough one - both mentally and physically - that requires a tough individual to do it successfully. DNR conservation officers work all hours of the night and day, in weather conditions fair and foul, in the woods and on the water, very often alone. As a matter of course, they can expect that many of the people they encounter will be armed, and, in the case of night hunters, trespassers or other outlaws, perhaps unwilling to accept a ticket or a trip to county jail without putting up a fight. All of that and more comes with the territory when you put on that instantly-recognizable green uniform, which makes recruitment and training a top priority for the agency. "I feel like we have one of the best-trained and best-equipped - if not the best - group of conservation officers in the Southeast," says the DNR's Deputy Director of Law Enforcement, Col. Chisolm Frampton. "These individuals are the cream of the crop. We set a high standard for education, knowledge, physical conditioning and personal character, and I believe that really pays off in the quality of the individuals who wear this uniform and the job that they do for the citizens of this state." 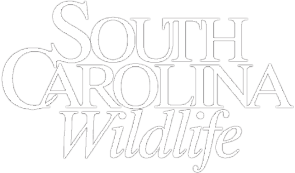 The DNR's Operation Game Thief and Coast Watch programs allow citizens to get involved in the protection of South Carolina's wildlife, fish, coastal and other natural resources. Rewards of up to $500 are paid to individuals who provide information leading to the arrest of natural resource law violators. In addition to supporting the rewards system, donations to the program pay for the toll-free, round-the-clock telephone reporting system. Call 1-800-922-5431 to report a violation. The Property Watch program provides assistance to private landowners with property protection and deterrence of trespassing to hunt or fish and provides methods for landowners to make their property less attractive to would-be trespassers. For more information, call 803-734-4002. The DNR's aviation program plays an important role in the agency's day-to-day law enforcement mission by conducting day and night air patrols over land and water, as well as assisting other DNR divisions with wildlife and habitat research, and other law enforcement agencies with critical public safety missions, emergency response, and search and rescue missions. 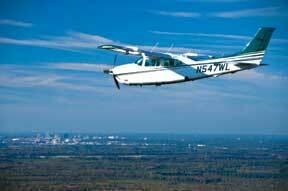 DNR's pilots are sworn law enforcement officers who utilize three aircraft - a P68 Vulcanair, a Cessna 206 and a Cessna 210 - to carry out this diverse set of missions. 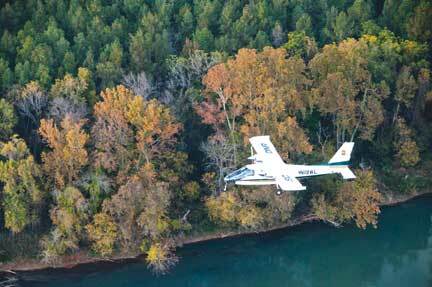 All missions undertaken by the DNR flight crew are important, but none more so than the race against the clock that occurs when a child or vulnerable adult is lost in the woods. In those instances, the same technology used to spot night hunters or count sea turtle nests along the coast can become a critical lifeline in search and rescue efforts. DNR pilots and trained officers using the "FLIR" (forward looking infrared) camera mounted in the nose of the DNR's Vulcanair plane become the eyes and ears for searchers on the ground. These tools have saved many lives since the flight program began. 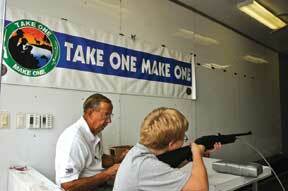 The DNR's Hunter Education program promotes safe enjoyment of the outdoors by teaching responsibility and ethics in the field and firearms safety. 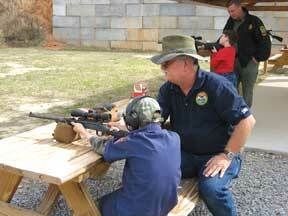 Anyone born after June 30, 1979, must complete a hunter education course before receiving their state hunting license. The DNR's Boater Education program teaches the fundamentals of safe and responsible boating, reducing loss of life, personal injury and property damage while increasing boating enjoyment for outdoor enthusiasts. Boaters under sixteen years of age are required by law to pass an approved boater education course before operating, without supervision, a personal watercraft or a boat powered by a fifteen-horsepower or larger engine. The DNR's TOMO program is designed to teach safe hunting practices and provide students with no previous hunting experience with life-changing outdoor experiences by pairing them with experienced adult mentors who can pass on these traditional outdoor skills. "It's just extremely rewarding to see the look on a child's face when that light comes on and you see that passion for the outdoors being kindled in them," said Sgt. Lynwood Kearse, the program's coordinator. Hunt clubs, plantations and other sponsors, as well as numerous volunteers (including DNR officers), help organize and run TOMO hunts to provide opportunities for youth around the state. The program also works in conjunction with other initiatives whenever possible. 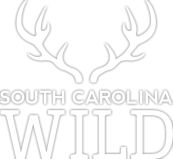 An annual TOMO deer hunt in the ACE Basin takes place together with a "Wounded Warrior" hunt sponsored by the Lowcountry chapter of Safari Club International and a number of ACE plantations. This past season, the participants in the ACE Basin TOMO hunt were the children of S.C. National Guardsmen and women deployed overseas. South Carolinians love the water. 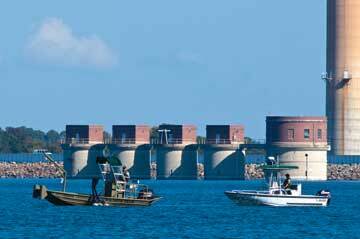 In fact, the Palmetto State has the eighth highest number of registered boats in the nation. Boating safety and enforcement is a priority for DNR officers year-round, but in the summer months, initiatives such as "B-SAF" (Boating Safety Action Force), saturation patrols during holiday weekends or special events, courtesy boating inspections and public outreach efforts hit high gear. During high-traffic weekends, regattas, fishing tournaments or other events, B-SAF teams in specially equipped boats place extra officers and stepped-up patrols on popular lakes and rivers in all four law enforcement regions, as well as offshore in Region IV. 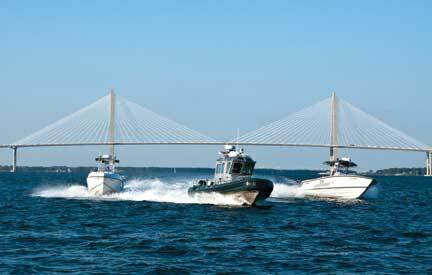 Boating under the influence is a factor in a large percentage of boating accidents where injuries or death occur, and the DNR works closely with the South Carolina Highway Patrol to prevent and enforce BUI/DUI violations. These efforts are publicized through media campaigns such as the "100 Deadly Days of Summer." In addition, DNR officers at busy boat landings offer free courtesy inspections of watercraft so that potential safety problems or violations can be corrected before boats are ever put on the water. Day or night, the members of the DNR's aquatic investigation and recovery team are often the first to be called when a drowning occurs or another law enforcement agency needs assistance in deep water. 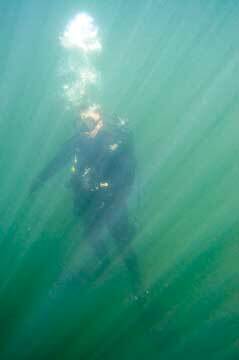 It can be a tough assignment, often involving the search for and recovery of drowning victims or the securing of crime scenes. It's stressful, says DNR Director Alvin Taylor, himself a former Dive Team member, and the job requires officers to juggle regular duties with diving assignments. And, like so many other aspects of the job of conservation officer, it's a duty that requires putting service to the public ahead of one's own comfort. "For the family and friends who are waiting for a loved one to be recovered after a drowning or fatal accident, it's just a terrible time," says Taylor. "Our efforts to bring that loved one home - as quickly as we possibly can - are extremely important to us and to those families. It's a responsibility that we take very seriously." South Carolina's Archery in Schools program has grown from ten pilot schools to more than two hundred public and private schools in just a few years. The schools participate in a two-day state tournament held each year in conjunction with the Palmetto Sportsmen's Classic at the State Fairgrounds in Columbia. 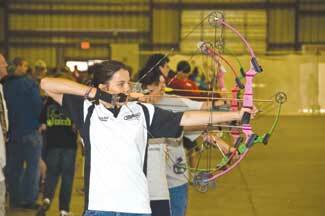 First-place teams and individuals are eligible to compete at the National and World NASP tournaments. In addition to working with outdoor education programs for young people coordinated by the DNR's Law Enforcement Division, such as TOMO or Archery in Schools, DNR field officers also spend countless hours volunteering as mentors or organizers at DNR lottery-drawn youth hunts for deer and waterfowl, youth day hunts for waterfowl and doves on DNR-managed properties, family fishing clinics, rodeos and tournaments organized by the DNR's Wildlife and Freshwater Fisheries Division. These outreach efforts are a critical part of protecting our state's natural resources over the long term, creating the next generation of committed conservationists in South Carolina. "Serving as mentors to young people and getting them engaged in the outdoors might be the thing we do that has the longest-lasting impact on our state's natural resources," said DNR Director Alvin Taylor. "Once that love of the outdoors gets turned on in a young person, it's hard to turn off." Investigations - In addition to the day-to-day focus on enforcement of the state's game and fish laws, DNR officers are also responsible for investigating boating and hunting accidents, stolen boats, littering and illegal dumping. Emergency Response - DNR officers serve as first responders during extreme weather or other emergency situations. Homeland Security - DNR officers assist state and federal authorities with security at nuclear facilities, the Port of Charleston and other locations that could be vulnerable to terrorist attack. Staff Operations - Officers and staff in the DNR's Columbia office manage federal grant funds allocated for enforcement of game and fish laws; coordinate training for DNR officers; and oversee communications and dispatch, record-keeping and other administrative functions. Education - DNR officers are assigned to teach Hunter and Boater Education classes that promote safety and responsibility while in the field or on the water. 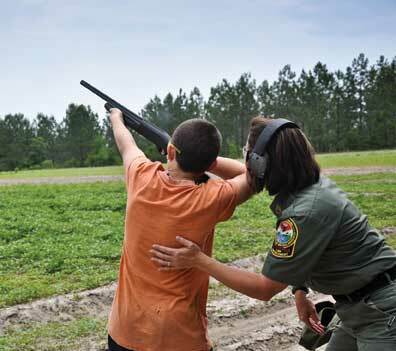 Hunter Education and outreach has grown to include shooting sports-oriented programs such as Take One Make One and the South Carolina Archery in Schools programs that provide a safe environment for young people to learn shooting and outdoor skills that will stay with them for a lifetime. A.I.R Dive Team - Members of the DNR's dive team are sworn officers trained in the use of diving gear. 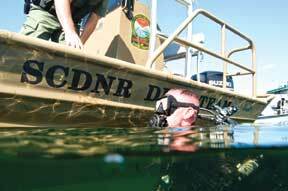 They participate in underwater searches for drowning victims and assist SLED and other law enforcement agencies with evidence recovery in criminal investigations. Flight Program - Officers who are trained pilots support law enforcement efforts, search and rescue missions and DNR research projects. Governor's Security Detail - DNR officers work as part of the Governor's rotating security team. Chaplaincy - Volunteer chaplains provide crisis counseling for families and DNR officers involved in high-stress situations, such as drowning or hunting accidents. Lots of people think it would be cool to put on the green uniform worn by the men and women of the DNR's Law Enforcement Division, and they're right, it is. In fact for Capt. Robert McCullough, a twenty-nine-year veteran of the agency, "cool" doesn't begin to describe the pride, dedication and loyalty he feels when he buttons up that green shirt every morning to come to work. 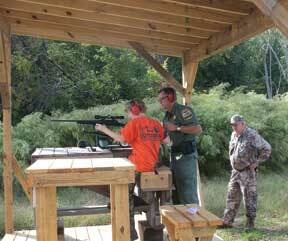 "Being a DNR conservation officer is not what I do for a living," said McCullough, "it's who I am. And any of the other officers working in this division will tell you the same thing." Have you ever wondered if you have what it takes to earn that uniform? If so, read on. DNR conservation officer candidates must be U.S. citizens with a bachelor's degree, or have at least two years of college with sixty semester-hours earned and one of the following: two years of class I law enforcement experience, two years active military experience, or four years deputy law enforcement officer experience. For information about the additional application requirements, visit www.dnr.sc.gov and click on "Employment opportunities." DNR officer candidates go through an initial interview in front of a panel of officers and staff, a written examination, and rigorous physical agility and swimming tests. Candidates who pass the written and physical tests undergo a final interview with the Deputy Director of Law Enforcement and an extensive background investigation. Successful candidates must also complete twenty weeks total of intensive training at the S.C. Criminal Justice Academy: twelve weeks of basic law enforcement, and eight more of specialized DNR instruction. Make it through all that, and you'll finally have the privilege of wearing that coveted green uniform. You'll also have what Capt. McCullough and the other 190 members of the DNR conservation officer corps believe is the toughest, best job in the Palmetto State.